The commandry or preceptory of the Knights of St John of Jerusalem (a military monastic order similar to the Knights Templar) was established in Carbrooke in 1193 and was suppressed by Henry VIII in 1540. The site is represented by a series of well-preserved earthworks and parch marks visible on aerial photographs. These have revealed the moat which forms a horseshoe around the east part of the site, at least three fishponds and three or more buildings. The western part of one of these buildings was excavated in 1998 during the extension of the local primary school. This revealed flint, brick and mortar foundations some for possible timber walls above foundation level. A fourth fishpond that was filled in with kitchen rubbish (including swan, heron, songbirds and lobster) in the 15th century was also discovered. A prehistoric ditch and a timber-framed Late Saxon building were also excavated. Site of Commandry of St John of Jerusalem. ('The Battlefield' or 'Knight's Hill'). Various Early Saxon and medieval finds reputedly from this site; also a socketed axe mould. E. Rose (NAU) 1 February 1982. 1996. Additional parchmarks noted by owner, who informed NLA. Visit added further features to 1995 earthwork survey north-west of main building outline. B. Cushion (NLA) August 1996. Evaluation excavation revealed walls, possible kiln; Roman and Late Saxon sherds, medieval and post medieval levelling and occupation layers. E. Rose (NLA), 24 October 1997. January - March 1998. Excavation. Excavations exposed the western side of the most south-westerly of the building ranges, consisting of a number of flint and mortar structures, some possible with timber superstructures. A 13th century fishpond, reused as a midden from the 15th century until the Dissolution, revealed large quantities of animal bone, showing that the monastic diet at Carbrooke was wide ranging. See report (S2) in file. A. Cattermole (NLA), 6 April 2005. Under excellent grass cover, grazed by sheep. A little poaching on bank south of church. H. Paterson (A&E) 12 April 1998. Visited at request of Philip Walker (English Heritage) to discuss owner's plans to retain water in the fishponds. Following excessive rainfall, area is already wet and owner has decided against any alterations, as this could cause flooding of the farm drive. 25 April 1994. NLA air photography (S3). M. Brennand (NLA), 31 January 2001. 26 June 1996. NLA air photography (S4). Photographs taken of preceptory earthworks. 29 July 1996. NLA air photography (S5). H. Clare (NLA), 30 April 2001. 7 August 1996. NLA air photography (S6). Earthworks of commandery clearly visible. 29 January 1998. NLA air photography (S7). 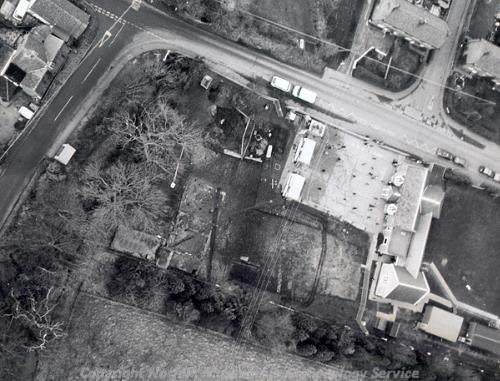 Aerial photographs record the 1998 NAU excavation located to the immediate south and east of the school. S. Massey (NLA), 1 November 2001. Scheduled monument consent granted concerning the removal of trees, providing an all-weather covering to the ground service and upgrading the existing stock boundary. May 2011. Archaeological Watching Brief. Contexts 1-6. Very few archaeological remains were encountered during excavation of 21 inspection pits and two shallow exploratory holes below slabs at St Peter and St Paul's CEVC School. Masonry remains believed to be part of a flint wall, or the footings for a wall similar to those observed in the 1998 excavation (S2) were the most substantial remains encountered. Other remains, to the west of the Scheduled area, were considered to be a modern sandpit. E. Ford (HES) 12 October 2012. EAA Occasional Paper No.21 published seE (S11). --- Aerial Photograph: TF9502 A-G,T-V,X-Z,AA-AL; TF9401 F.
--- Article in serial: Clark, W. G. 1907. The Distribution of Flint and Bronze Implements in Norfolk. Transactions of the Norfolk and Norwich Naturalists' Society. Vol VIII Pt III (for 1906-1907) pp 393-409. p 407. --- Article in serial: Clarke, R. R. and Myres, J. N. L. 1939. Norfolk in the Dark Ages, 400-800 A.D., Part I. Norfolk Archaeology. Vol XXVII, Pt II pp 163- 214. p 166. --- Article in serial: Clarke, R. R. 1940. Norfolk in the Dark Ages, 400-800 A.D., Part II. Norfolk Archaeology. Vol XXVII Pt II pp 215-249. p 237. --- Article in serial: 1952. Archaeological Journal. Vol IX p 116. --- Monograph: Page, W. (ed.). 1906. The Victoria History of Norfolk. The Victoria History of the Counties of England. Vol 2. pp 423-425. --- Serial: Blomefield, F.. 1805-1810. An Essay Towards a Topographical History of the County of Norfolk.. Volume Unknown. --- Publication: BM Add Mss23,054. --- Aerial Photograph: Edwards, D.A. (NLA). 1995. TF 9502ABP - ACB. --- Aerial Photograph: Edwards, D.A. (NLA). 1998. TF 9502AN - AS. --- Aerial Photograph: Edwards, D.A. (NLA). 1999. TF 9502ACU - ACW. --- Publication: Coad, V.. 1979. AM7. --- Monograph: Cushion, B. and Davison, A.. 2003. Earthworks of Norfolk.. East Anglian Archaeology. Vol 104. p 133. --- Article in serial: Gurney, D. (ed.). 1996. Excavations and Surveys in Norfolk 1995. Norfolk Archaeology. Vol XLII Pt III pp 397-412. p 399. --- Publication: Knowles, D. and Hadcock, R. N. 1971. Medieval Religious Houses of England and Wales. pp 300, 302. --- Article in serial: Gurney, D. and Penn, K. (eds). 1998. Excavations and Surveys in Norfolk 1997. Norfolk Archaeology. Vol XLIII Pt I pp 193-210. p 195. --- Archive: Clarke, R. R. and NCM Staff. 1933-1973. Norwich Castle Museum Record Card - Bronze Age. Carbrooke. --- Archive: Clarke, R. R. and NCM Staff. 1933-1973. Norwich Castle Museum Record Card - Early Saxon. Carbrooke. --- Archive: Clarke, R. R. and NCM Staff. 1933-1973. Norwich Castle Museum Record Card - Medieval. Carbrooke. <S1> Unpublished document: Crowson, A.. 1997. NAU Report No. 276. Evaluation Excavation at St Peter and St Paul VC Primary School, Carbrooke..
<S2> Unpublished document: Hutcheson, A.. 1998. NAU Report. Excavations at St Peter and St Paul VC Primary School, Carbrooke, 1998. Post-Excavation Assessment of Archaeological Potential..
<S3> Aerial Photograph: TF 9502/ ABF, ABG, ABH, ABJ, ABK, ABL, ABM, ABN. <S4> Aerial Photograph: Edwards, D.A. (NLA). 1996. TF 9502ACK - ACT. <S5> Aerial Photograph: Edwards, D.A. (NLA). 1996. TF9502/ACC - ACE. <S6> Aerial Photograph: Edwards, D.A. (NLA). 1996. TF 9502ACX - ADG. <S7> Aerial Photograph: Edwards, D.A. (NLA). TF 9402D - M; TF 9502AM, AT - ABE. <S8> Scheduling record: DCMS. 2008. Scheduled Monument Consent. <S9> Unpublished document: Bates, S. & Crawford, R.. 2002. NAU Report No. 777. Report on an Archaeological Evaluation at North Farm (West Plot), Carbrooke, Norfolk..
<S10> Unpublished document: Bull, M.. 2011. NPS Archaeology Report 2740 An Archaeological Watching Brief at St Peter and St Paul's CEVC School, Church Street, Carbrooke, Norfolk. <S11> Monograph: Hutcheson, A & Noble, C. 2006. Excavations at the preceptory of the Order of St John of Jerusalem, Carbrooke, Norfolk. East Anglian Archaeology Occasional Paper. No. 21.